Kelsey Durham The Citizen: Common belief is that the invention of the printing press made it easier to produce books, but Robert LoMascolo says that's not necessarily the case. 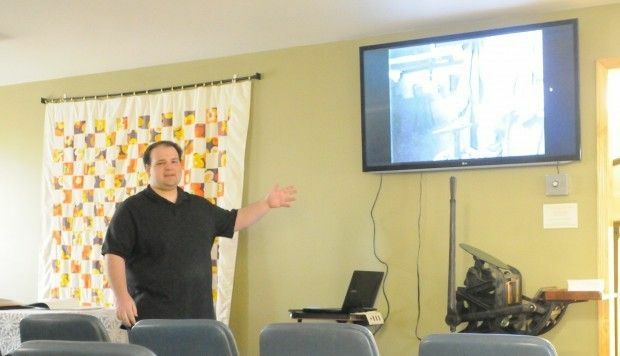 The Ward W. O'Hara Agricultural Museum hosted LoMascolo on Saturday for a discussion titled "Printing Then and Now," during which he talked about the history of letterpress printing and how it has evolved over the years. LoMascolo said his interest in the history of printing developed in an unexpected way while in his freshman year at Wells College. "I needed an elective and I saw that they were offering a book binding course and I had no idea what it was about," he said, "so I had to try it." LoMascolo found that he loved learning about printing and decided to stick with it, eventually going on to earn a master's degree in book arts. Since then, he has hosted a number of workshops throughout the area, teaching digital design and the art of book designing to people in the community. At his discussion on Saturday, LoMascolo talked about the very beginning of the printing press, in the 15th century, and worked his way up to modern day, showing how the process of printing books and other material has changed throughout centuries of innovation. "We're all so used to digital these days that the idea of something done by hand really appeals to people," LoMascolo said. "This gives you an idea of how much was involved in making books in the 1400s and 1500s." He spoke of the Gutenberg Bible, the first book recreated on a printing press in the 1450s, and talked about famous historical figures, like Benjamin Franklin, who were involved in printing press work and impacted the process over time. Though this was the first letterpress printing lecture that LoMascolo held, he is hoping to continue his work throughout the community, and said hopes that this type of history is something that people will continue to grow interested in as time passes. "The history of it is just really interesting," he said, "and the machines are pretty neat, too."